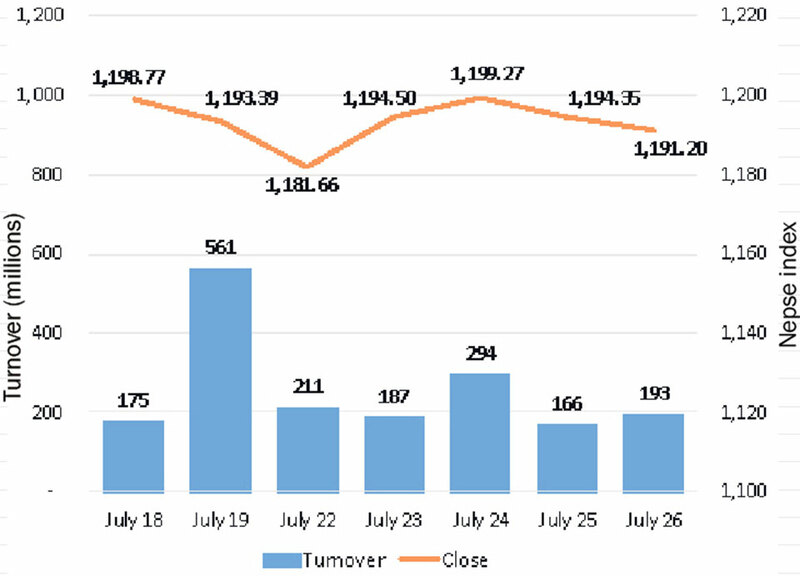 KATHMANDU, July 24: Stocks ended in green on Monday after four straight losing sessions. The benchmark Nepal Stock Exchange (Nepse) index gained 12.84 points to close the day at 1,194.50 points. Despite the index recouping losses from the previous session, the overall sentiment remains bearish as the market is still below the 1,200-point mark. Additionally, the day's gain can be seen as a correction in the market following a series of bearish sessions. The market, however, turned in another below average turnover of Rs 186 million. All major sub-indices, except the Hotels sub-index which ended flat, posted gains on Monday. Microfinance group was the market leader as its sub-index ended the day 2.32 percent higher. Similarly, the sub-index of Non-life Insurance also climbed 2.28 percent. Further, Others and Hydropower sub-indices also closed 1.37 percent and 1.33 percent, higher. Banking sub-index also logged gain of 0.8 percent. Banking scrips dominated the list of active stocks on the day led by shares of Nepal Investment Bank Ltd. More than Rs 16 million worth of shares of the bank were traded in the second marked on Monday. Next on the list was Nabil Bank Ltd which turned in a turnover of Rs 10 million followed by Nepal Investment Bank Ltd Promoter Share and Nepal Bank Ltd with total transactions of over Rs 8 million each. Rastriya Beema Company Ltd's shares worth more than Rs 6 million changed hands on the day. In terms of gaining stocks, Naya Nepal Laghubitta Bikas Bank Ltd turned in the best performance for the day as its share price climbed by 10 percent. The microfinance company closed its book on Monday for 250 percent rights issue which is beginning on August 12. Himalayan Bank Ltd also recovered 6.27 percent after reaching a two-year low of Rs 526 per share on the preceding day. Similarly, Jalabidyut Lagani Tatha Bikas Company Ltd, Sana Kisan Bikas Bank Ltd and Reliance Finance Ltd also gained over 5 percent each. Tinau Bikas Bank Ltd led the list of losing stocks as its share price fell by 4.41 percent after posting four straight days of gains. Siddhartha Equity Fund's unit price also fell by over 4.25 percent. Gurkhas Finance Ltd, Karnali Development bank Ltd, Sanima Equity Fund and Nabil Equity fund also saw their share prices fall. On news front, Nepal Bank Ltd published its financial report for the fourth quarter on Monday. The commercial bank reported a 9.04 percent rise in net profit year-on-year. As per the report, its current net profit stands at Rs 3,399 million. Its share price climbed over 2.47 percent to close at Rs. 290 per share. As per the ARKS technical analysis, the Nepse index snapped its four-day losing streak with a bullish candlestick formation on Monday. Despite the surge seen on the day, the index trading below 1,200-point level indicates that the market is yet to see a significant shift in the sentiment. Hence, long positions can be taken only if the index maintains above the 1,200-point level supported by notable volume.